John Hipwell won 36 caps for the Wallabies and captained them in nine Tests. He made his debut for New South Wales Country in 1966 against the touring Lions side and took his Test bow in 1968 aged 20. 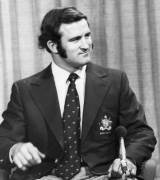 He started his tenure as Wallabies captain in 1973 against England and he called time on his career in 1981 aged 33. He was inducted to Australian Rugby Union's hall of fame in 2006 and is survived by his wife and two daughters.